Leaf blowers have long been standard equipment for landscape maintenance pros (AKA “mow-and-blow” crews). If you’re ready to beef up your own yard care arsenal, weigh the pros and cons of the main types of blowers: electric and gas. Your decision will most likely be based on 5 factors (in no particular order): maneuverability, nuisance (noise and emissions), weight, maintenance and price. BTW, mow-and-blow pros always use gas models, since none would be foolish enough to ask clients where they can plug in their equipment. Before we get to the differentiating factors, it’s important to note that, performance-wise, gas and electric leaf blowers are pretty much equally effective. This is true of standard handheld models appropriate for most homeowners. For those who want the power of a professional-grade backpack blower, gas is the only option. 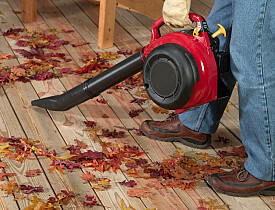 Many of today’s leaf blowers have a vacuum and mulch function in addition to blowing, and this is available on both gas and electric models, but on handheld versions only. Not to spoil the ending, but it’s fair to say that maneuverability is really the only benefit that gas blowers have over electric. But that can be a big benefit, depending on the size of your yard and how many trees you have to work around. Electric blowers remain tethered to an extension cord at all times, limiting your range to about 100 feet from the nearest outlet (that’s in a straight line). There are such things as cordless leaf blowers, but at present, they lack the power to do much more than clean hard surfaces, like driveways. There’s no way around it: leaf blowers are noisy little buggers, so noisy that some municipalities and homeowners associations have restricted their use (don’t worry; you can still ride your Harley home at all hours of the night). In general, gas leaf blowers are louder than electric. If noise is an important factor, you shouldn’t rely on manufacturers’ decibel ratings (if available). Instead, ask your retailer to start up any model you’re considering, to see how loud it really is. Ear protection is always a good idea when using leaf blowers. As for emissions, or exhaust, electric blowers have none (at least not at your house). Gas blowers do blow some smoke, of course, and how much depends on the model. Four-cycle engines are more efficient and cleaner-running than two-cycle engines; some even pass California’s tough emissions laws. If you’re wondering which type is greener, it’s electric. Yes, electricity comes from coal-burning power plants (in most cases), but small gas engines pollute disproportionately for their output. In other words, your carbon footprint is bigger with gas than with electric for the same benefit. On average, electric wins in this category. Among the models tested by Consumer Reports, the electric blowers range from 4.5 to 9 pounds; the gas blowers start at 8 pounds and go up to 11.5. The most common “maintenance” tasks you have to perform with a gas blower are buying and refilling the gas. There’s also oil, which must be mixed with the gas on 2-cycle engines and changed periodically on 4-cycle machines, not to mention the spark plug and probably some minor seasonal maintenance requirements (for off-season storage). Electric blowers have none of these. No contest. Electrics start at about $30; gas models range from about $80 and up. However, you will need to purchase a long extension cord for an electric, if you don’t already own one. And you should buy a good cord that’s rated for the amperage draw of the leaf blower. Skimpy cords often don’t provided enough juice, especially at 100 feet, and under-powering is hard on electric motors. It should be pretty straightforward by now: If you need range and easy maneuverability, go with a gas leaf blower. If you don’t mind dealing with an extension cord while you work, get an electric. Electrics are cheaper, lighter, quieter, require less maintenance and are easier on your city’s smog problem. A final tip: If you have to choose between nozzle types: wide, flat nozzles are better for corralling leaves in the yard, while round nozzles are better for more concentrated force—good for getting up stuck leaves in the yard and stubborn debris on hard surfaces. Some models come with both. If you'd prefer to leave leaf removal to a mow-and-blow crew, find a reliable landscaper in your area.